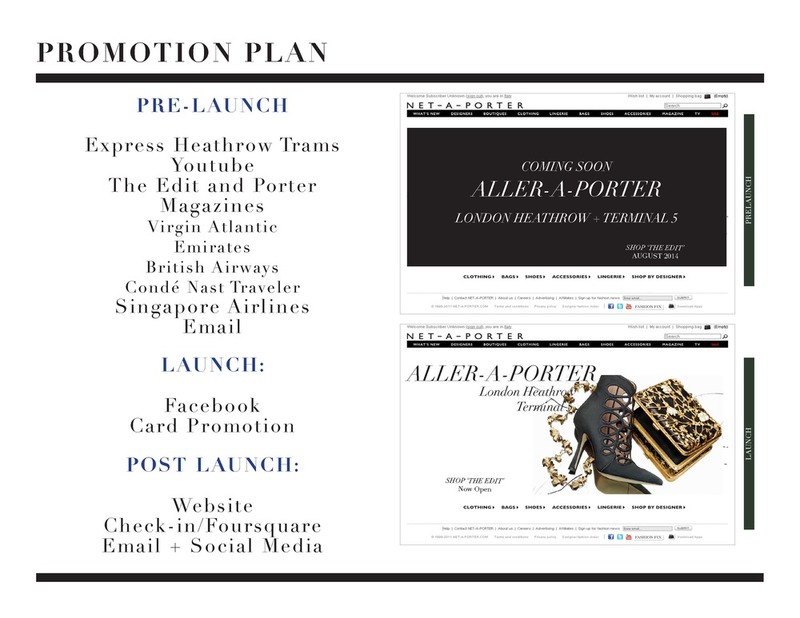 “Aller-A-Porter” was created as a non-traditional retailing initiative for pure play retailer, Net-A-Porter at London Heathrow International Airport, Terminal 5. 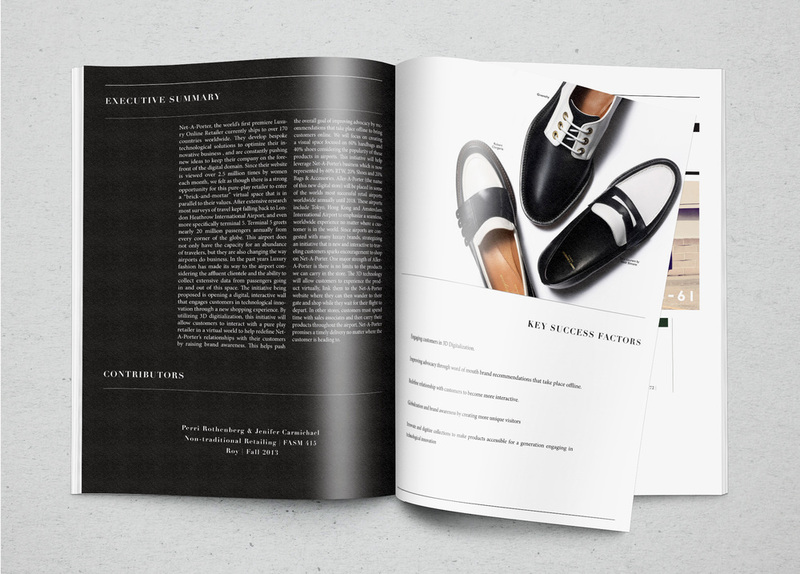 This initiative was based off of Net-A-Porter’s current achievement within the luxury sector along with their positioning, merchandise assortment, distribution and promotional strategies. 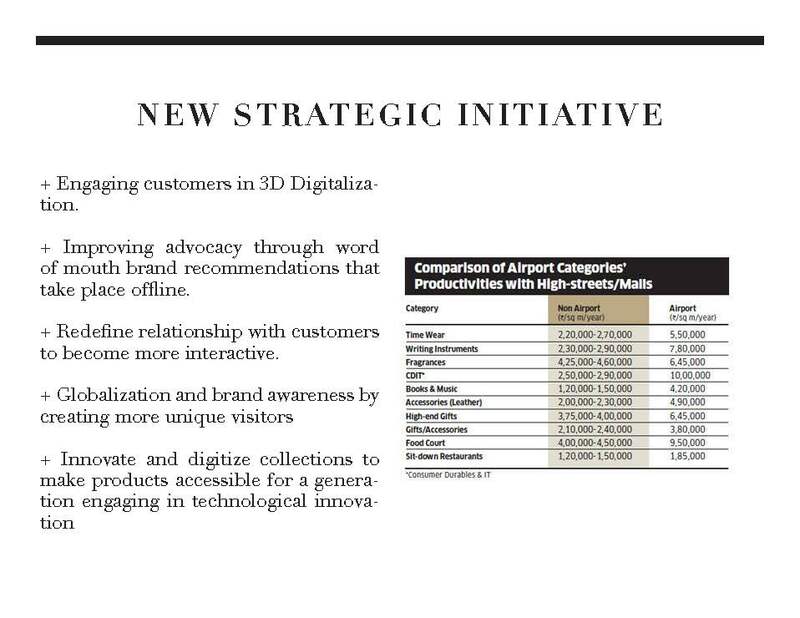 After extensively researching the size of the market including direct competitors, target customers and psychographic / behavioral data of airport shoppers we created a solution. This solution includes a 12-18 Month strategy based off targeted key success factors, an omni-channel initiative, a budget for execution, a sales forecast and a projected income statement. 1. 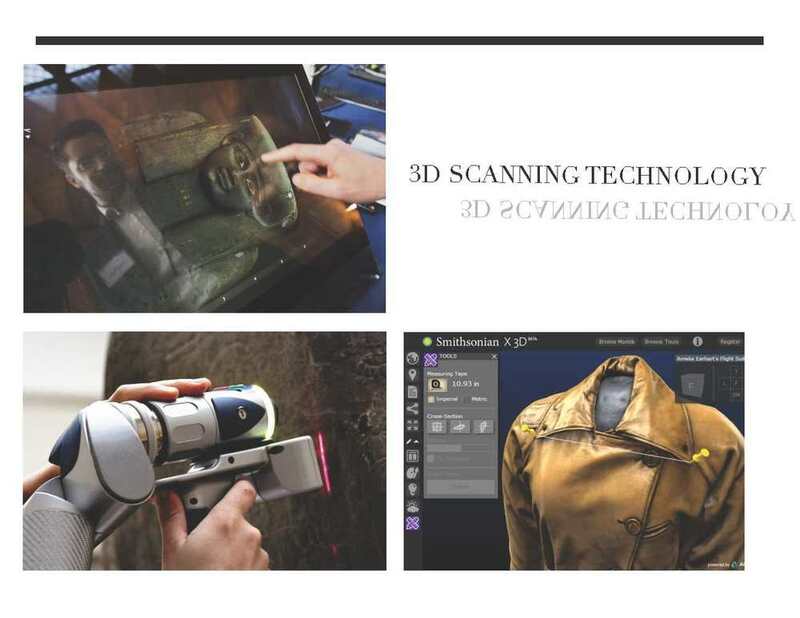 Engaging customers in 3D Digitalization. 2. Improving advocacy through word of mouth brand recommendations that take place offline. 3. Redefine relationship with customers to become more interactive. 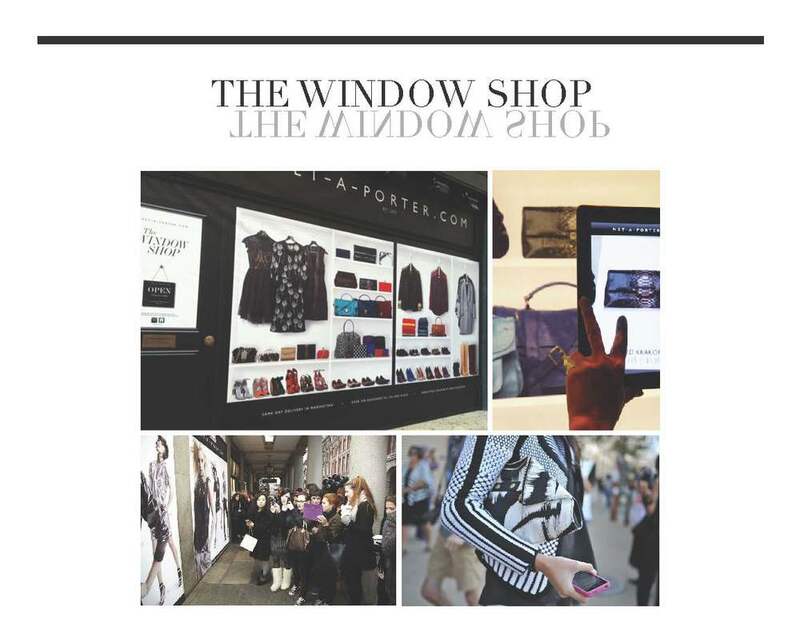 THEORY \ Aller-A-Porter strives to engage the Net-A-Porter customer in a retail experience that has not been done before. 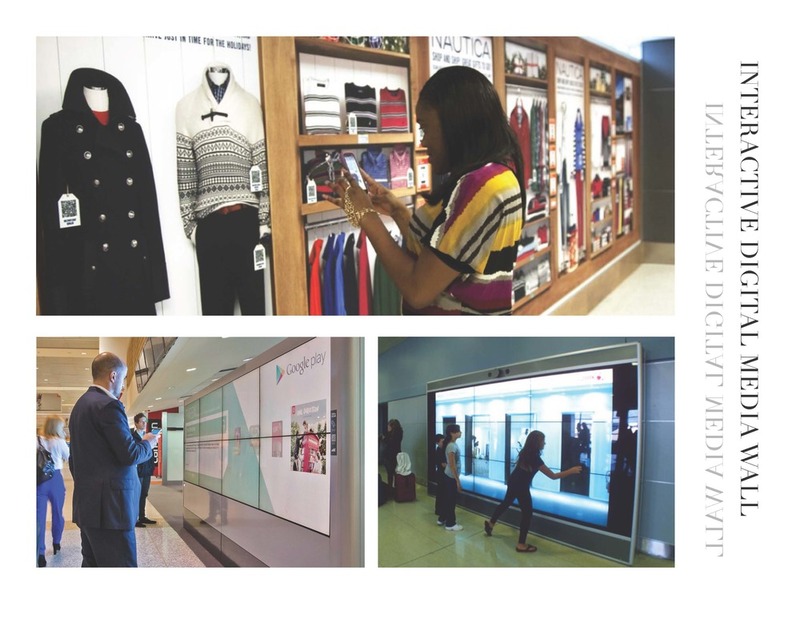 The Interactive wall substitutes a brick and mortar retail space without the product, yet does not lack the customer experience or attention one would receive at a boutique. 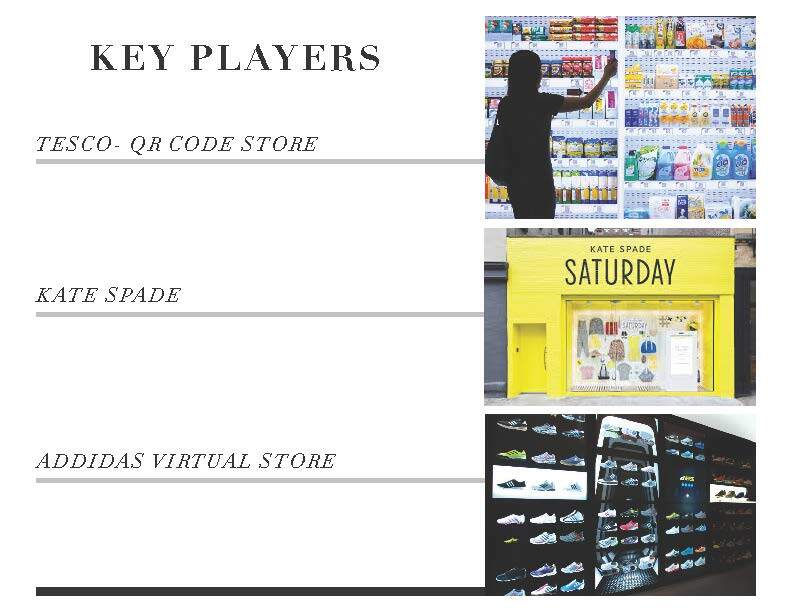 By retailing in exclusive spaces such as airports, specifically and initially London Heathrow International Airport Terminal 5 (LHR) customers from all over the world can engage in a pure-play retailer by interacting with three dimensionally scanned products. This will help ensure the quality ensured with their product. This store creates a quick yet engaging way for customers to experience a product on their own time and with their own freedom. The expected outcomes of this initiative are quite high. Although there will be progressive expenses due to the inauguration of one new digital location annually until 2018, the high amount of traffic in a concentrated location makes up for this. 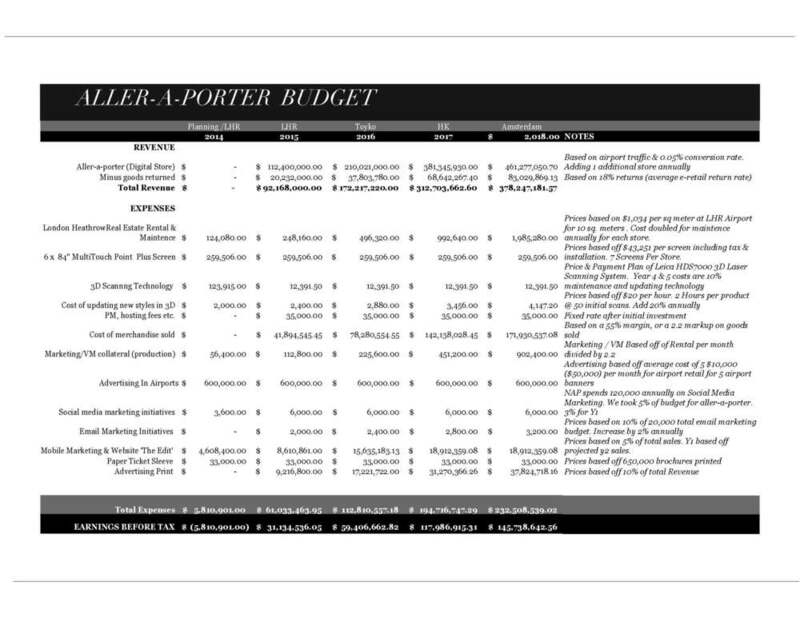 In year 1, there will be no products sold due to promotion and testing and Aller-A-Porter will take a loss of nearly $5 million dollars. 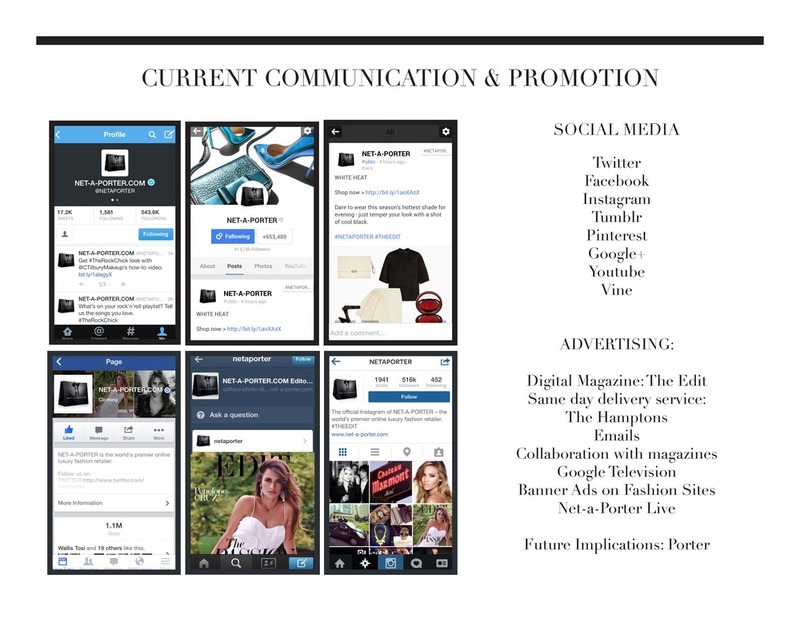 With the opening in Y2, the 20 million customers will be exposed to marketing initiatives in magazines, advertisements, and social media promotions. 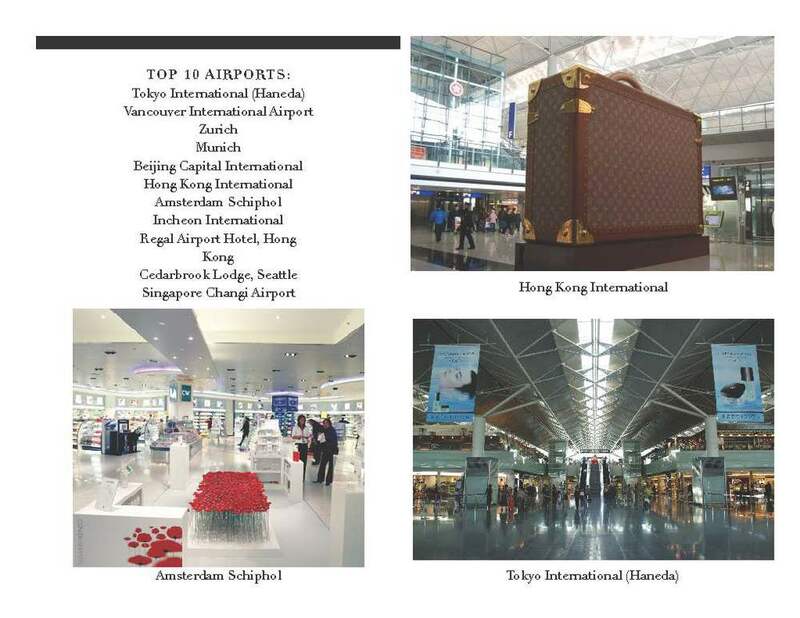 This plans to create a buzz for this new experience consumers can only experience in these specific airports. At Heathrow alone, 70 million passengers a year with an hour or so to kill adds up to serious spending power. So popular are the airport’s shops that last year sales per square foot at its retail outlets hit a staggering £2,782 – making it one of the most productive shopping destinations in the country (Neville). The departure lounge of LHR Terminal 5 accounts for 450 million dollars of sales in accessories, clothing, jewelry and perfumes from top brands. 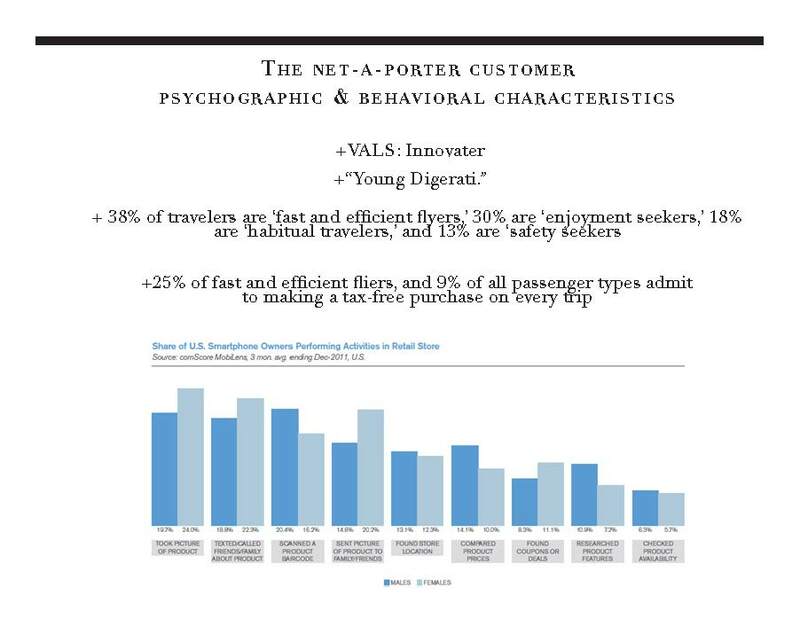 (Merllery-Pratt) The terminal 5 experiences is setting the bar for the future and may compare the airport experience to the mall experience. Some consumers may even do their big seasonal purchases at the airport. Net-A-Porter wants to get involved in an innovative way, and we believe this initiative will set them at the forefront of the digital domain while penetrating their presence in the luxury retailing industry even further into the competitive landscape. 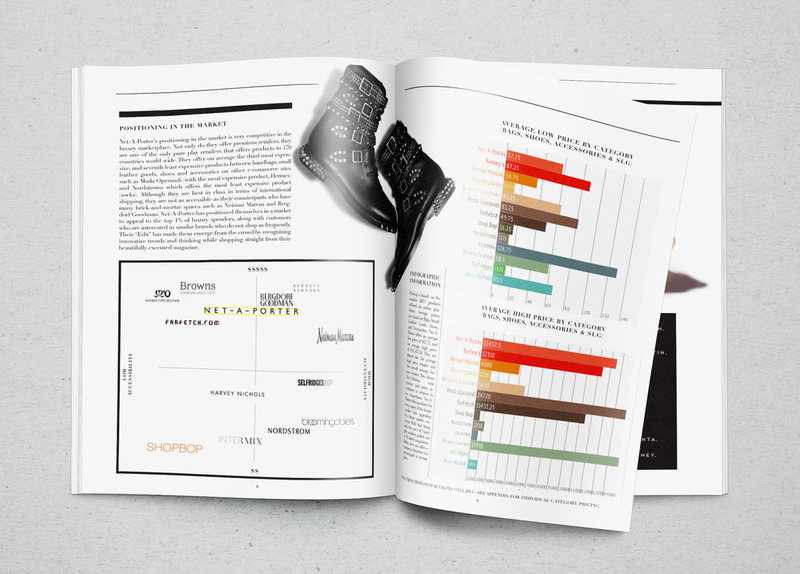 Net-A-Porter embodies a name that is recognized and respected world wide. With the power of their name, brands and innovation, the new way to shop “The Edit” is to digitally see the real size and detailed versions of the products on an interactive wall, scan them, walk away, purchase it and have it home before you are. After all, there is noting more exciting than coming home from a spectacular vacation or stressful work trip to see a beautifully wrapped matte black box and white ribbon waiting for you at the door. + SCAN WITH SMART PHONE, WALK AWAY, KEEP SHOPPING. 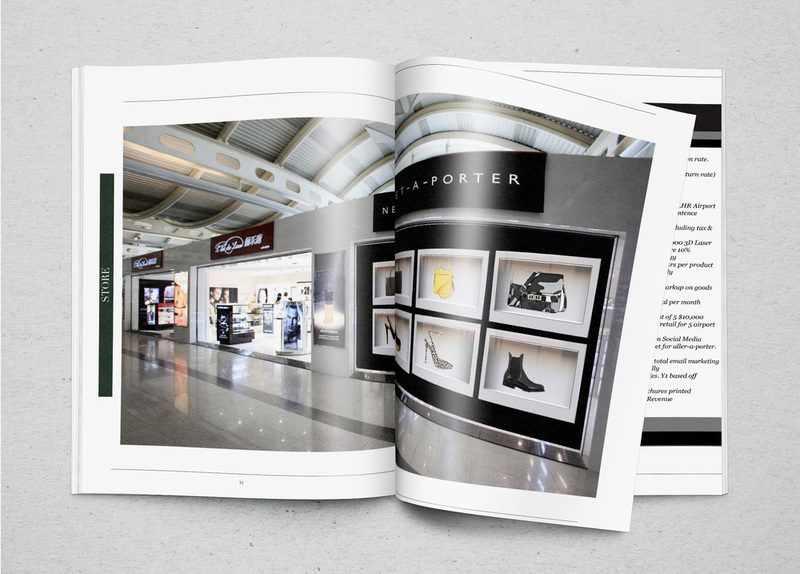 The allocated budget for Aller-A-Porter is based off of the traffic of each airport, conversion rates of products purchased and the total transactions made from an assortment of 60% bags, and 40% shoes. 40% of Net-A-Porter ’s total sales comes from Bags and Shoes which is why we have chosen to focus on boosting sales and brand awareness with this initiative. Luxury Retail prices have nearly doubled in the past 13 years according to Bergdorf Goodman’s. With this being said, we have planned a 4% increase annually for handbags, and 3% annually for shoes. With that beings said, we chose an average mid-point price for our London Heathrow Store, and the average price of purchase will increase with the addition of each digital store. Our revenue by category is composite of Location + new location annually. For example Y1 London. Y2 London + Tokyo. Y3 London + Tokyo + Hong Kong. The total revenue is based off of the revenue of the digital store, with a conversion rate of 0.5%, along with the addition of adding 1 store annually and with 18% returns. This rate was the average accessory return rate of Luxury goods. Our expanses range from Real Estate, 3D Technology software, maintenance, Advertising in airports, printed magazines, along with social media and e-mail marketing initiatives. In Y1 we take a profit loss of nearly $5 million . Although our expenses increase annually with the addition and maintenance of new stores, the revenue created from the high volumes of traffic justify advertising and maintenance costs. 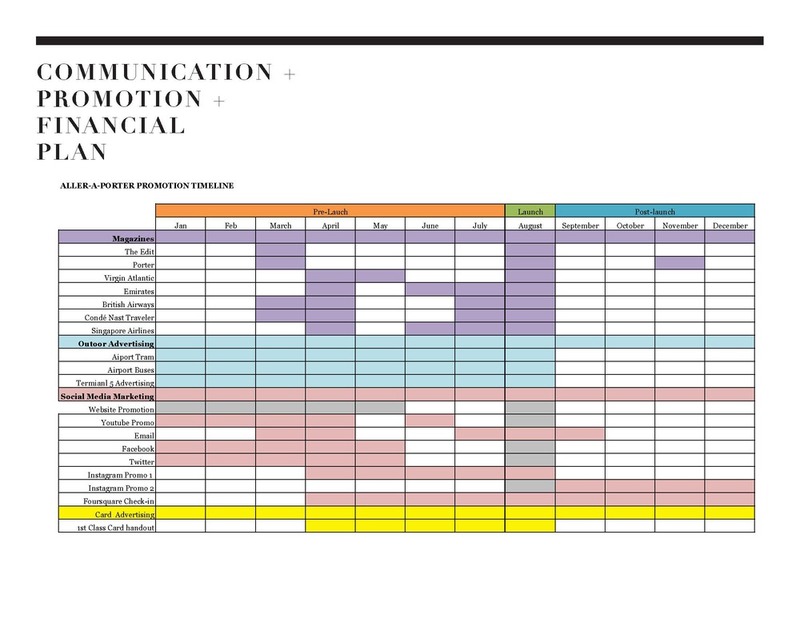 By 2018 our expenses are nearly $232 million, but we still profile $145 million.